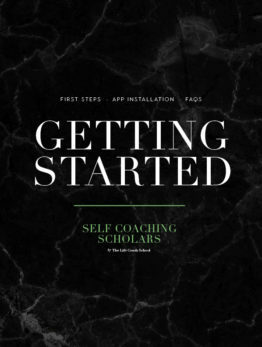 Self Coaching Scholars is a monthly membership program. The cost of $297 per month is automatically charged to your card. You pay for your membership in the prior month. For example, if you sign up in December, your first month of membership will be January. You will have access to the bonus materials immediately upon signing up, and will get access to the Monthly class when the new month begins. Q: Is there any kind of guarantee? Yes! And it’s BOLD! If you do this work, your life will change for the better. Period. But you have to give it effort, practice, and time. At least a full year. But here’s the deal… If you sign up and decide this work isn’t for you and you don’t want to keep working with Brooke, you can cancel your membership at any time. This is not in your best interest, but it’s absolutely your choice. AND EVEN BETTER…If you stick with the program the entire year and do all the work and your life isn’t waaaay better than when you started, simply send back all 12 completed monthly workbooks and Brooke will give you all your money back for the entire year! Q: How can I update my credit card? Click here to update your credit/debit card. This will process a $0 authorization and will update your card on file. Be sure to use the same email address you use for Self Coaching Scholars. Q: How do I change my shipping address? Please email your new shipping address to kim@thelifecoachschool.com no later than the 16th of the month to update for the next month’s shipment. Please email kim@thelifecoachschool.com and she can check on the status of your package. Q: I’m an International student, where are my packages? We do not ship internationally, however all the same materials are available digitally for you to download on the membership site. Q: Can International students pay extra to have the physical materials shipped? We do not ship internationally. Many of our Scholars have the materials printed and spiral bound locally if they want a hard copy. If you have a US forwarding address, you can email kim@thelifecoachschool.com to update your shipping address. Click here to visit the cancellation page. Q: Is it too late to cancel for this month? If you submit your cancellation request by the 15th of the month, your cancellation will be effective the last day of this month. If you are cancelling on the 16th, or after, your cancellation will be effective the end of next month. Q: Can I sign up again if I cancel? You will not be able to sign up again for one full year after canceling. Q: Once I cancel, do I still have access to the months I’ve purchased? Self Coaching Scholars is a membership (like a gym membership), you have unlimited access as long as you are a member. If you cancel, your membership is disabled at the end of the last month you paid for, and you will no longer be able to login to the membership site. Q: When will my access to the site and coaching calls end? You will have full access to the site, coaching calls, and all online materials until the end of your paid month. Q: How do I get coached live by Brooke? Each week you will receive a reminder email for the call with the most up-to-date guidelines for submitting your coaching request. Please reply to that email with your coaching request following the guidelines. If you still have questions after reviewing the reminder email, please email kim@thelifecoachschool.com. Q: I was unable to attend a call live, when will the call recording be available? We do our best to get the call recordings updated on the website within 24 hours of their completion. You will find them at the very bottom of the page of the current month by navigating to CLASSES > MONTH. Q: How do I update my password? To update your password, click here to go to the lost password page. Make sure you use the email address that you created your membership with. Q: How do I make sure I know what time the call is in my time zone? From the calendar on the current month page (CLASSES > MONTH) you can add the call to your Google Calendar. The time zone will be automatically converted for you by Google Calendar. You can read more here. You can also use this Time Zone Converter. Q: How do I download the audios for the calls? How can I listen to them offline? Please download the Getting Started Guide at the bottom of this page for detailed instructions. Looking for One to One Coaching? Something amazing is coming in May.